An oceanfront jewel, our beautiful Mazatlán resort offers endless diversions for vacationers, including two swimming pools with swim-up bars (including one for adults only), an outdoor hot tub overlooking the ocean and a private, secluded beach. Our 20-acre setting is a natural habitat for wildlife, including swans, flamingos and peacocks that meander amid 150-year-old mangroves, koi ponds and tropical gardens filled with flowers and an array of palm species. Guests enjoy a variety of activities for all ages, including yoga classes, nature preserve and botanical tours, tennis, bartending and cooking classes, Spanish classes, as well as creative children's activities. With shimmering beaches lined with palm trees to the history and charm of Old Mazatlán, the "Pearl of the Pacific" delights visitors at every turn. Relax on magnificent sand beaches, walk along El Malecón - the longest waterfront boardwalk in Mexico - and explore Stone Island. Enjoy fishing, boating, swimming and surfing in the azure waters of the Pacific or go diving and snorkeling in the crystal-clear waters around Deer Island. Mexico's top sport fishing destination, Mazatlán is the billfish capital of the world. Enjoy a deep sea fishing adventure where the Pacific Ocean collides with the Sea of Cortez. Hook big blue and black marlin, sailfish, yellow fin tuna, dorado, wahoo, and grouper, charter boats and tours from three marinas, including La Marina Mazatlán, the largest marina in Latin America. With four spectacular golf courses, Mazatlán is a golfer's paradise. One of the top courses in the world, El Cid Golf & Country Club features the championship 18-hole El Cid Mazatlán and Lee Treviño designed 9-hole Marina El Cid. Designed by Robert Trent Jones Jr., Estrella del Mar on Stone Island is one of Mexico's most loved golf courses. Club Campestre Golf and Country Club also offers an enjoyable 9-hole course. 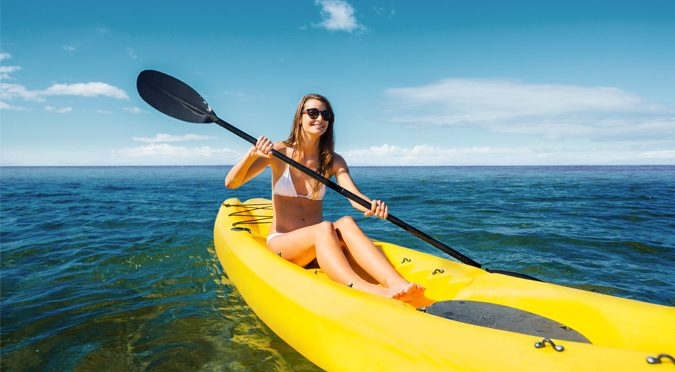 Enjoy boating, sailing, yachting, kayaking, jet skiing, windsurfing, parasailing, catamaraning and Hobie Cat rides into the vast ocean and to offshore islands. Fishing and boating enthusiasts can rent sailboats, yachts, catamarans and trimarans at Marina del Cerro del Crestón and Marina del Cid. Walk through La Zona Dorado, which is filled with shops selling everything from crafts and jewelry to clothing and art. Bargain at Los Tiangis, an open-air bazaar, on Sunday mornings and explore the colonial heritage of Mercado del Centro in Old Mazatlán. Located off the Mazatlán shore, the Three Islands - Deer Island, Bird Island and Wolf Island, are beautiful destinations for fun and adventure. These pristine offshore islands offer tranquil sand beaches and azure ocean waters for scuba diving, snorkeling, swimming, boating, kayaking and canoeing. Edging the Pacific, Mazatlán features gorgeous sand beaches for soaking up the Mexican sun, relaxing with a drink and partaking in a variety of sand and sea sports. With gentle sandy slopes and calm waves, the area between the Zona Dorada and the three islands offers sparkling sands for sunbathing and adventure.